Noted for her deep, resonant contralto voice, Melbourne singer Liv Maessen launched her career in 1969 when she entered the popular TV talent quest New Faces. The young mother of two won her heat and went on to take out second place in the series final. Her prize was a recording contract with Ron Tudor's independent production company June Productions, and Liv began making TV and club appearances, building up a broad fan base that ranged from adults to pre-teens. Her first single was a song called "The Love Moth". Released on the Polydor label in Dec. 1969, it scraped into the bottom end of the national Top 40 in April 1970, peaking at #39. Liv's second single, issued in April 1970, was a cover version of Mary Hopkin's Eurovision entry and UK hit "Knock, Knock, Who's There?". Liv's version was included in the first batch of singles released by Tudor's new record company Fable Records, and it quickly shot to the top of the Aussie charts. It became her most successful recording and one of the biggest Australian singles of the year -- it peaked at #2 nationally in June, stayed on the chart for an extraordinary 23 weeks and earned Liv the unique distinction of being the first Australian female singer ever to be awarded a Gold Record, for sales of over 50,000 copies. Notwithstanding her considerable talent, timing was a key factor in Liv's pop success. Like several other contemporary acts including Sydney band Autumn and Fable labelmates The Mixtures, Liv's records were able to gain significant airplay due to the imposition of the 1970 Radio Ban. In May that year, just as Liv's second single was hitting the stores, a simmering "pay for play" dispute between the commercial pop stations and record companies erupted into open conflict. Most of the major recording companies operating in Australia at the time -- including EMI, Phonogram (later Polygram) and the three major American labels, CBS, RCA and leading Australian label Festival -- decided to scrap a long-standing arrangement with the commercial radio sector, demanding that commercial radio pay a new royalty for records played on air. When the commercial radio sector refused, the companies imposed a six-month ban on the supply of promotional records to commercial radio stations. British label EMI, then the market leader in Australia, was the hardest hit and many UK hits from late 1970 were only heard in Australia via local cover versions. The main effect, in the short-term, was that the pop stations were denied free access to new major label recordings for a period of six months, so they turned to the independent labels like Fable, Image and Sparmac, who had refused to take part in the Ban. Tudor and Fable made the most of the situation by releasing locally-recorded cover versions of proven overseas hits that , because of the Ban, faced only minimal competition from the originals. Notable Fable successes included Liv's version of "Knock, Knock, Who's There? ", The Mixtures' version of Mungo Jerry's "In The Summertime", and a cover of Cat Stevens' "Wild World", credited to the fictitous studio band Fourth House (the single was in fact recorded by session musicians and featured an uncredited lead vocal by Danny Robinson, ex Wild Cherries). For her third single Liv moved into the country-pop genre with a fine rendition of Anne Murray's US hit "Snowbird" (Aug. 1970). It made the national Top 20, but this proved to be her last chart hit. Undoubtedly, the single biggest reason for the abrupt decline in Liv's commercial fortunes was the end of the Radio Ban in mid-October 1970. It's certainly notable that after three consecutive Top 40 hits in the space of a year, she had no chart success thereafter -- yet, despite this, she was voted the second most popular Australian female vocalist (after Colleen Hewett) in the Go-Set Pop Poll of that year and early in 1971 she was awarded the Goerge Wallace Memorial Award for Best New Talent at the 1971 Logie Awards. In March 1971 she released her fourth single, "Hurry On Down", which sold only moderately and didn't chart. By this time Australian commercial radio stations were beginning to adopt a new programming regime that was being promoted by the Digamae consultancy, headed by former 2SM DJs Rod Muir and Hans Torv. The Digamae format was based on the hugely successful programming system devised by the American Drake-Chenault company, who had revolutionised American Top 40 radio in the late 1960s. The result was vastly increased ratings and profits for commercial stations, but it also meant a significant increase in the proportion of overseas (and especially American) recordings being played on commercial pop radio, whilst Australian artists like Liv found it harder and harder to get airplay. Liv's first LP Liv For Life was issued in July 1971 and another single, "Here I Go Again" came out in October. Several more Singles followed, inlcuding a duet with labelmate Jimmy Hannan, which was released in October 1971 but sank without a trace. Sadly, none of Liv's post-1970 releases made any impression on the charts. 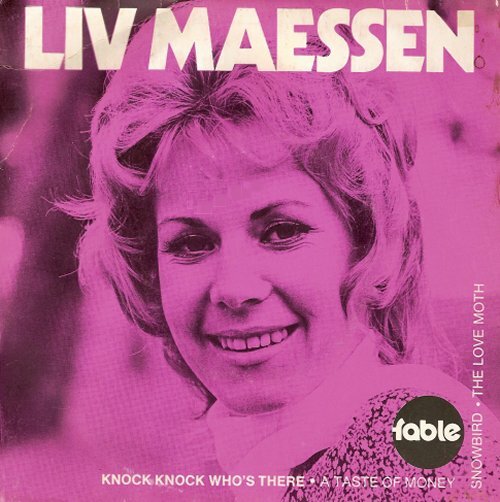 An EP Liv Maessen, which combined her first two Singles, was issued in January 1973 as part of series of nine EPS featuring Fable artists including The Mixtures, Hans Poulsen and John Williamson. This appears to have been her last release for Fable. In 1974 Live released a new single on the Philips, "Hey Mama, Sing Me A Song" which was apparently her last commercial recording. The single was produced by Dermot Hoy (real name Bryan Vaughan), a Sydney-born DJ, engineer and producer who spent several years in the UK in the late 1960s working at legendary British pirate station Radio London, where he was the panel operator for expatriate Aussie DJ Tony Windsor. (aka Tony Withers), a pioneering rock'n'roll DJ of the late 1950s/early '60s, and one of the original 2SM "Good Guys". Liv continued to work in cabaret and on television for the next few years, but her career seems to have petered out in the late 1970s and nothing is currently known about what she is doing these days. "Knock, Knock, Who's There?" / "A Taste of Money'" // "Snowbird" / "The Love Moth"